As we come to grips with a new post-election reality, what does abstraction have to offer? Much has already been written about the recent presidential upset and the newfound sense of dread many of us have going forward. Nearly two weeks after election day, as the grief has hardened in our bellies and something approaching normalcy has returned to daily life, those of us who lost are left fumbling for silver linings and symbols of solidarity. Perhaps a cogent response can be found in activism, philanthropy, and volunteerism, somewhere beyond the white savior complex of the safety pin and the mathematically untrue #notmypresident. Some people are finding solace in the notion that hard times will make for good art. Jerry Saltz, writing in New York Magazine, says that “Trump’s victory is a crucible of possibility for a new generation” of artists. He’s right, I suppose, although it’s cold comfort amid a nation-wide spike in incidents of hateful harrassment, dire warnings about our climate crisis, and newfound uncertainty about a whole host of other issues. Artists will fight back against bigotry and regression, as should we all, and I’m sure the results will be beautiful and inspiring. But it’s a sad day when we stare doom in the face and blithely look forward to getting some good albums out of it. But abstraction does not happen in a vacuum, neither for the artist nor the viewer. Perhaps I was projecting a bit, but I did actually find a variety of social and political undertones throughout the show. 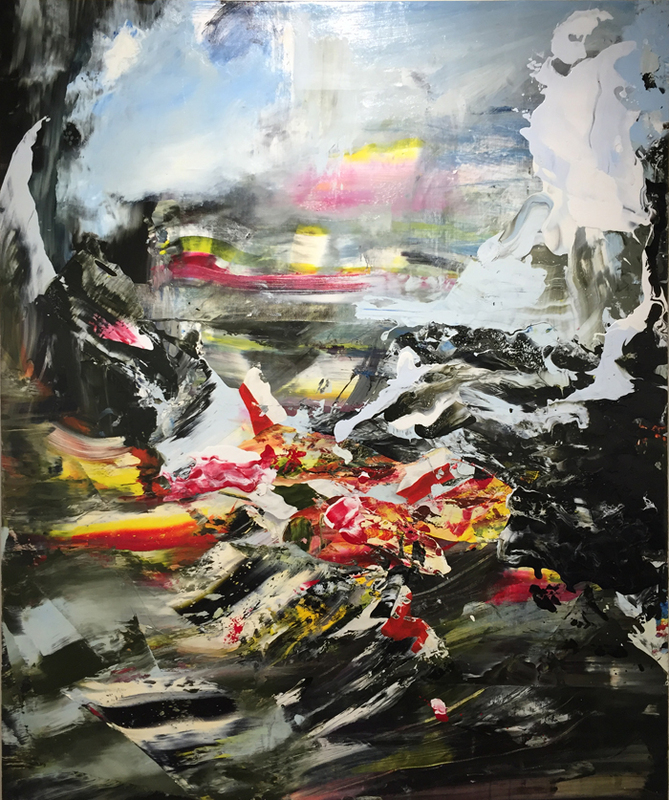 The most evident are in Matt Reimers' large, explosive compositions. From afar, the paintings look like volcanic landscapes, with waves crashing against cold rocky outcrops and tidal pools of reds and yellows forming under a tranquil sky. Up close they are violent and haphazard, a flurry of colors shot wet through a chipper-shredder. 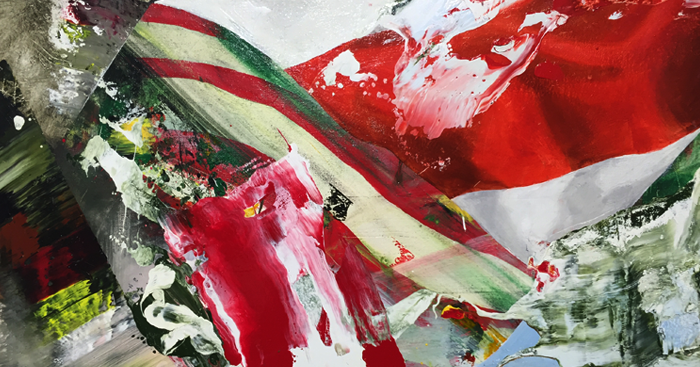 The American flag is there, violently fragmented, rendered as splatters and scrapes of thick oil paint, the primary colors of our national banner being overtaken by swampy greens and dirty whites. Sound familiar? Of all the work in the exhibit, Reimers’ is the most obviously appropriate to current events; the rest of the show is by comparison quite placid. But don’t mistake a lack of fire for a lack of substance. 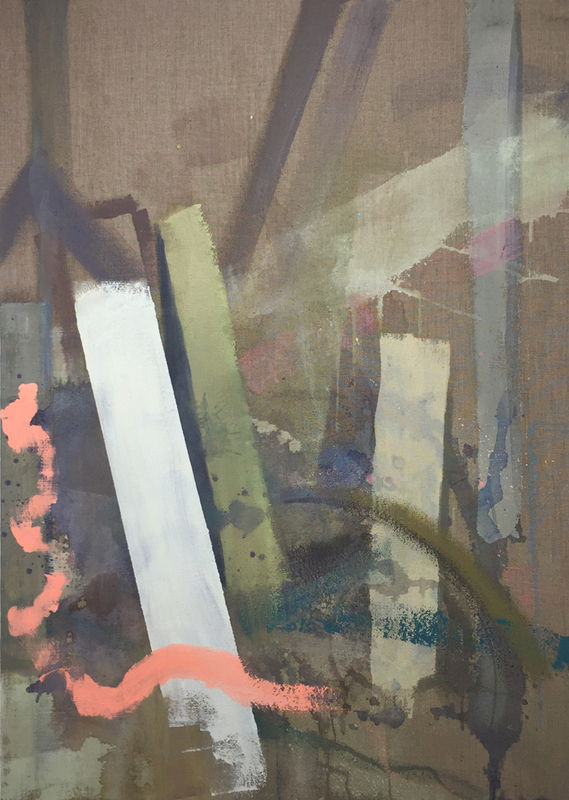 There is an airy, faded geometry to Jordan Clark’s paintings, their bare linen canvases showing through gray and weathered. Inspired by his view of buildings in Portland, Clark’s compositions are muddy visions of order and chaos, of dominoes beginning their topple amid quick brushstrokes and muted pops of color. Interspersed throughout the show are small scale paintings by Kayla Plosz. Though steeped in the little strokes and symbols of contemporary illustration, the work has echoes of early Jean duBuffet and late Philip Guston, two artists who tackled the world’s ugliness head on. I must admit, I tend not to enjoy the current vogue of peppering big beautiful walls with tiny little paintings, but Plosz’s pieces are scrappy little numbers nonetheless. Some of them pack a real punch. The most polished work in the show is Jeremy Szopinski’s, contrasting thick squeegeed ripples of color over clean, angular planes. Like data points mapped over glass, they have a frenetic organization to them, in some pieces reading as graceful landscapes, in others as an essential tremor. Oddly enough, his artist statement is the most politically-minded of all four: he claims to be inspired “by the seemingly ubiquitous and devastating doomsday anxieties that face us today: climate change, contagion, terrorism, political unrest, and other threats, both literal and metaphorical.” We’re right there with him, at least for the moment. It’s not all gloom and doom, though, as with Monument #16. 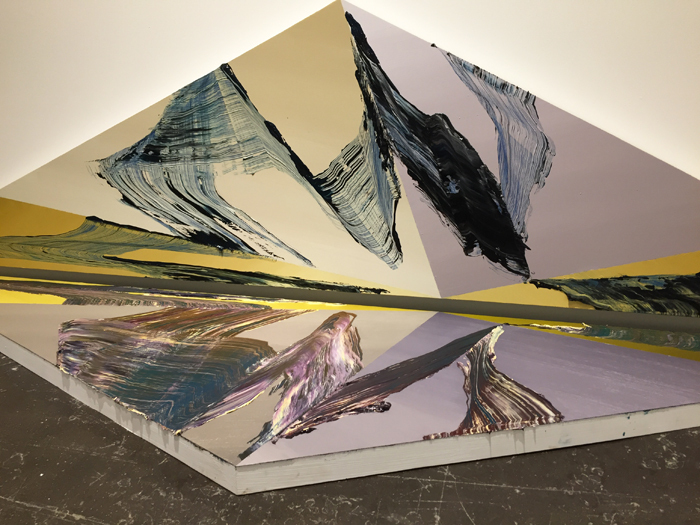 Two large triangular canvases sit perpendicular to each other, one unceremoniously laying on the floor, reflecting back a distorted crescendo in purples and yellows like mountains in a lake. The work is portentous and severe but quite beautiful as well. It may have all been made before the election, but the work in Hot Chroma still applies. The world was hardly innocent two weeks ago, and however inconsequential these paintings may seem to us in the midst of a political upheaval, they are just as important as ever. The show hits many notes but is ultimately cohesive, finding its center in the messy process of painting itself, of leaning entirely on colors, forms, and actions to provide meaning. Abstraction is responsive: it can afford us a reprieve from current events and offer, if not true comfort, at least some much-needed mental space. It can also hold a mirror to our grief and our anger in ways no political pundit ever could. We look to artists for an authentic experience, for their individual insights and for an affirmation of our shared humanity. Good artwork, in whatever form it takes, allows us to see the person who made it, to view their truth and be bolstered by it. As Saltz says in his New York essay, “That is because art isn’t a superfluous, elitist escape; it’s a way of knowing the world, a place to find common cause and not fall apart.” As we hurtle towards inauguration day and beyond, into an uncertain future, artists must use not just their politics but their lives in total as inspiration, as their means of fighting back. We will need all the help we can get. Hot Chroma is on view November 12 through December 30 at SooVAC. Gallery hours are Wednesday 11-5pm, Thursday-Friday 11-7pm & Saturday-Sunday 11-4pm. For more info, visit http://soovac.org.